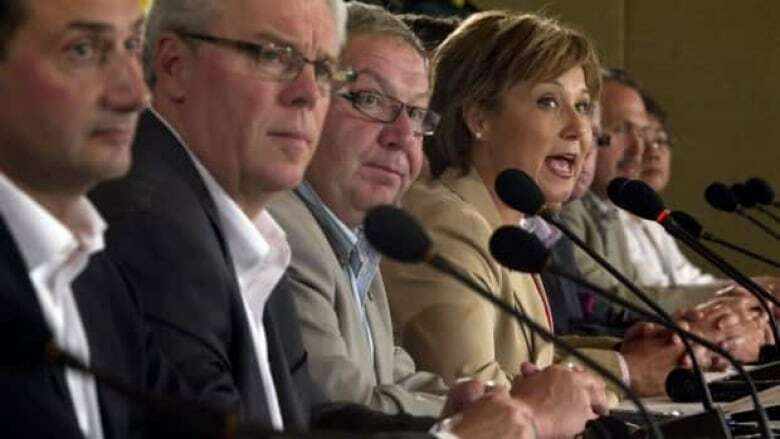 British Columbia Premier Christy Clark, Nova Scotia Premier Darrell Dexter and Quebec Premier Jean Charest make their positions on health-care funding known ahead of a two-day Council of the Federation meeting, which started in Victoria Sunday evening. Provincial and territorial leaders gathered in Victoria Sunday evening for their first meeting together since Finance Minister Jim Flaherty announced the federal government would stop providing health-care transfers at an annual increase of six per cent after 2016-17, and instead tie funding to economic growth. In an interview airing on CBC Radio's The House, British Columbia Premier Christy Clark and Nova Scotia Premier Darrell Dexter made their positions on health-care funding known ahead of the two-day Council of the Federation meeting. Clark told host Evan Solomon "the prime minister is right about this. If we keep spending increases at the rate that we have, we will bankrupt the system." While Clark, who is hosting the meeting, agrees with the federal government's decision to link the funding of health transfers to the rate of growth in nominal GDP, she told Solomon she had a word with Prime Minister Stephen Harper about moving to per-capita funding. "This idea that we're going to go to a straight per-capita funding for health care without adjusting it for age, it can't happen," said Clark. "I'm not saying throw away per capita. I'm saying refine it." The move to per-capita allocation was announced by the federal government in 2007 to ensure that all Canadians would receive the same health-care support from Ottawa, no matter where they reside. But according to Clark, "you cannot run a health-care system where you assume that the person who is 29 years old is going to incur the same amount of health care costs as someone who is 85 years old." "You can't run a health-care system, you can't run a country, unless there is age-adjusted per capita. That's what I told [Harper]," said Clark. The prime minister met briefly with Clark Thursday evening while in British Columbia on other business. In contrast, Nova Scotia Premier Darrell Dexter disagreed with the federal government's plan to nix the six per cent escalator. Dexter called Flaherty's announcement "an abdication of the responsibility of the federal government with respect to a national health-care system." According to Dexter, it means there will be "a significantly weaker health-care system in some parts of the country." Nova Scotia, for instance, would "lose $18 million in the first year but by the time it was fully in gear, we would receive about $157 million a year less under the Flaherty formulation," said Dexter. For his part, Quebec Premier Jean Charest deplored the lack of consultation with the provinces when the federal government made its announcement in late December. In an interview with Radio-Canada's flagship political program Les Coulisses du Pouvoir, Charest told Emmanuelle Latraverse the way in which the entire thing was handled was "unacceptable." "There was no discussion, no dialogue, it was unexpected, and came as a surprise to all," he said Sunday. "What's the point of working inside a federation if we don't talk to each other," asked an indignant Charest. He said it was "never before seen" in provincial-federal discussions. Charest also said he intends to raise the issue of equalization payments during the two-day meeting. New Democrats held a roundtable on health care featuring over a dozen experts in Victoria on Sunday. NDP health critic Libby Davies accused Ottawa of not doing more on the file. "After investing over $160 billion in health care, many of the reforms included in the 2003-04 health accords have seen little or even no improvement under Stephen Harper’s leadership," said Davies in a press release. While it is clear that each province and territory is drawing their battles lines with respect to health-care funding, it is less certain what will unite them in future discussions with Ottawa. Premiers began comparing notes during a dinner on Sunday night, with discussions officially getting underway Monday.